Password manager LastPass on Tuesday extended the ability to sync login credentials across all platforms and devices, a perk previously reserved for paying members. LastPass founder, VP and GM Joe Siegrist said in announcing the change that by offering the service for free across all devices, they’re making it that much easier for anyone to make good password habits the norm. Having a password manager that goes everywhere you do, he said, affords a strong foundation for securing and taking control of your identity. This is the second major change for LastPass in as many years. LastPass launched in 2008 and as PCWorld notes, was only offered for free on the PC (mobile device usage was limited to paying members). That changed in August 2015 when LastPass expanded the reach of its free service to mobile devices. The catch, however, was that free users would be restricted to just one device type. Now, you’re free to use LastPass for free across any and all device types. LogMeIn acquired LastPass in October 2015 for $110 million. For those already using LastPass Free, no action will be required to start using the password manager on all your devices. Simply download the app for your browser or mobile device and sign in. 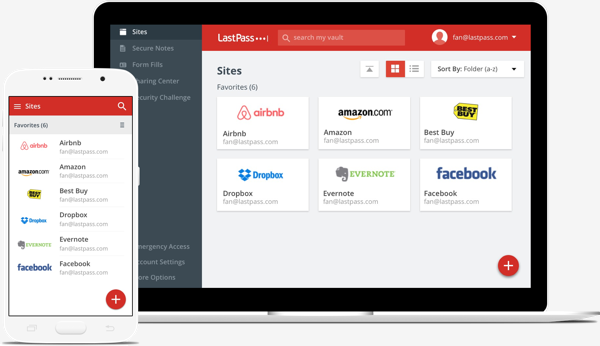 LastPass’ Premium service, priced at $1 per month, still offers features you won’t get with the free version including family password sharing with up to five others, two-factor authentication options, priority tech support and 1GB of encrypted file storage, among others.